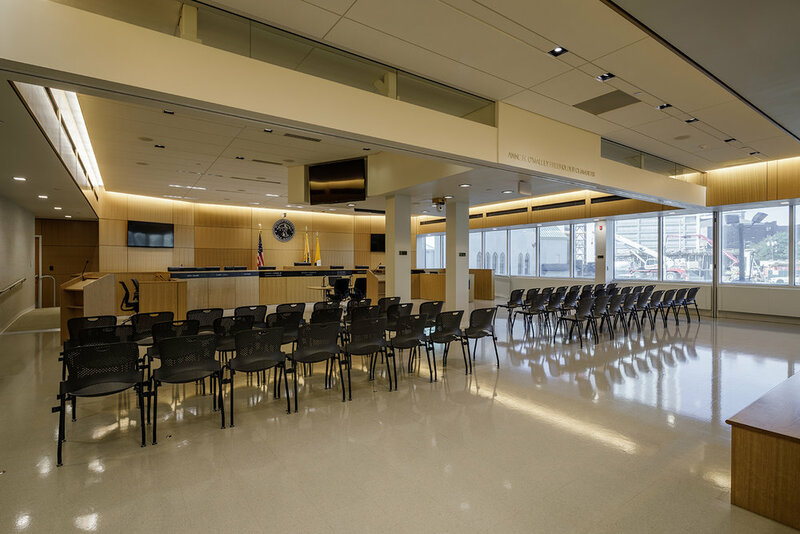 Tasked with maintaining operations during construction, many of the challenges posed by the Hudson County Administration Annex building were resolved through closely coordinated phasing. Flex space was allotted within the building to allow for a swapping of floor plates by the various user groups during the phased construction. The project entails a complete gut renovation, including new circulation patterns and technology upgrade. While the mechanical, plumbing, and electrical systems were brought up to date and made more efficient after years of ad-hoc modifications, a major impetus for the project was to address security concerns. A small addition was grafted onto the existing first floor core to accommodate a secure control and check point for building visitors. Through numerous iterations, The Musial Group, working intimately with the various user groups, developed and discovered efficiencies and fitting adjacencies with the intent of allowing for a high degree of flexibility while promoting accountability and communication between the various departments.